Congratulations to Dana Johnston who won a hotly contested chili cook-off event. 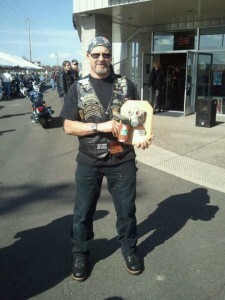 The event was held on March 24, 2012 at the Salem Harley-Davidson dealership on Silverton Road. The weather cooperated, giving us a beautiful day for chili, music and great fun with our fellow Harley riders. Dana had to fend off some 20 or so other competitors to win the cook-off and the voting was close! Perhaps he’ll cook up a batch for one of our rides this season… and if you intend to dethrone him as the Chili king, you better start perfecting that chili recipe right now!